The Urban Centre Database GHS-UCDB R2019A describes more than 10.000 urban centres identified by the application of the "Degree of Urbanization" model to the GHSL baseline data. This dataset is a successful result of the scientific cooperation among the partners of the GEO Human Planet Initiative. The partners are committed to support a novel evidence-based assessment of the human presence on the planet. The Urban Centre Database GHS-UCDB R2019A provides new open data supporting the monitoring of Sustainable Development Goals, the New Urban Agenda and the Sendai Framework for Disaster Risk Reduction. 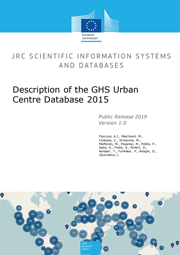 The Urban Centre Database GHS-UCDB R2019A is available for the open and free download as part of the GHSL collection in the JRC open data portal.